With time comes experience, and with that experience, Marvel has taken a bunch of barely watchable movies about superheroes, and turned themselves into a global empire. When Marvel first started making movies, they never dreamed they'd be getting the stars, exposure, or the nearly half a billion dollar box office receipts for every film they release. Perhaps the most overlooked element in Marvel's wave of success is the writers and directors, which is really what has led to the big stars, better films, and ultimately the TV series. Marvel attempted to introduce Daredevil in 2003, in what amounted to one of the worst superhero movies I've ever seen. The plot was nonexistent, they rushed the characters backstory, and the acting was a joke. They learned from theses mistakes however, and reinvented the character in the Netflix series by the same name. 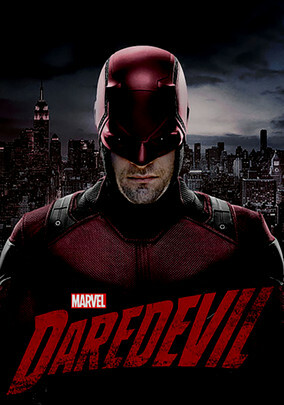 Matt Murdock (Charlie Cox) was blinded in an accident when he was a child, but despite losing his sight, he gained other abilities. His other senses became super strong and he was trained to use them to help defend himself. As a youth, despite his training, Murdock decided to fight injustice in the courts and became a lawyer, eventually starting a firm with him best friend, Foggy Nelson (Elden Henson). Being a lawyer didn't always get Murdock the justice he sought, so he started using his training, and going out at night to fight crime as the devil of Hell's Kitchen, eventually dubbed by the press as Daredevil. On the surface, people will look at this series and see another superhero show, but when you sit down to watch it, you will realize that the writing makes all the difference. This is one of those shows where the superhero element is an after thought, because everything else is so realistic and believable, that aside from the fight scenes, you forget that you're watching a Marvel superhero show. The criminals developed for this show, Wilson Fisk (Vincent D'Onofrio) and The Punisher (Jon Benthal) are as good, if not better, than any villain ever seen in any of the Marvel franchises. Beyond that the show has a lot of legal and courtroom elements to it, a medical angel, family and romance issues, I don't say this often, but this show actually does have a little bit of something thrown in there for absolutely everyone! Even if you're not into superheroes, even if you can't stand them, there will be at least one element to the Daredevil series that you will enjoy, I guarantee it. As for the fans, I know it's been a while, but no need to fret, Daredevil have been renewed for a third season, and lead actor Charlie Cox has signed on for the eventual collaboration series, that will include all four Netflix-Marvel characters. To know about Daredevil Season 3 Release Date just take a look and you get all the information you need.